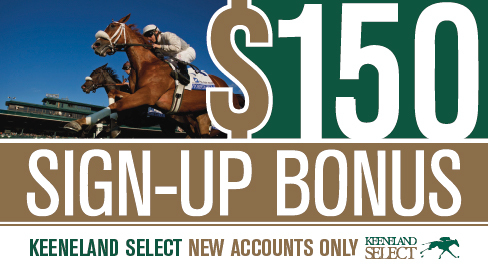 Sign up for a new Keeneland Select account and earn up to a $150 bonus! Bet $300 within the first 30 days and we will fund a $100 wagering credit to your account. Bet $5,000 within the first year of signing up and we’ll add another $50 to your account. This sign-up bonus is only for new Keeneland Select players. Bet a minimum of $300 within the first 30 days of signing up to receive a $100 wagering credit. Players that receive the $100 bonus are qualified to receive an additional $50 when they have bet $5,000 within the first year of signing up. Bets must be placed at www.KeenelandSelect.com, m.KeenelandSelect.com or by phone. On-track bets are not included or with FastBet. Each bonus will be deposited into the Player's wagering account within 10 business days (two weeks) after the Player has fulfilled the terms and conditions of this offer. Keeneland Select reserves the right to discontinue this promotion at any time. Keeneland Select also reserves the right to verify the identity and eligibility of any Player participating in the promotion and to disqualify anyone from receiving the sign up bonus if it is determined that the Player has not complied with the rules of the promotion, and/or has provided false or misleading information about his or her identity. Keeneland Select also reserves the right to refuse issuing bonuses to anyone at any time for reasons that Keeneland Select deems relevant. This promotion cannot be combined with any other new registration promotion, such as Select Friends. One new registration promotion per customer.